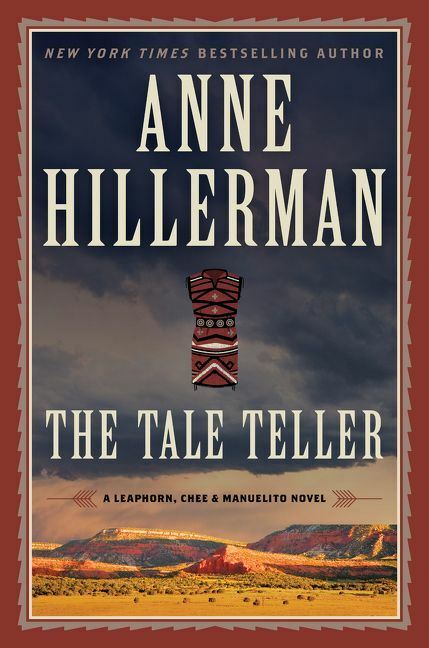 The Tale Teller is the new novel from author Anne Hillerman. It is the fifth novel in the “Leaphorn, Chee & Manuelito” book series, which began with Spider Woman's Daughter (2013). This series is a continuation of the “Joe Leaphorn and Jim Chee Series” written by Hillerman's late father, bestselling author, Tony Hillerman (1925-2008). In The Tale Taller, retired Navajo Tribal policeman, Joe Leaphorn, takes center stage in the case of a missing Navajo artifact. The Tale Teller opens with the retired Navajo police Lt. Joe Leaphorn, who is now a private investigator. Mrs. Daisy Pinto, the director of the Navajo Nation Museum, is offering Joe a contract to take a new case. The museum received a large box containing donations, but these gifts were made anonymously. The box came with a list of gifts, but if that list is accurate, then, two items that were supposed to be in the box were not found inside once the box was opened. One of the items is a, “biil,” a dress that was weaved and worn by “Asdza'a Tlogi” (“Weaver Woman”) or Juanita, a legendary figure among the Navajo people. The “biil,” if it were really sent to the museum, would be, by far, the most precious gift. Pinto wants Joe to discover the identity of the donor and also find the missing items, if they were sent. After accepting, Joe soon finds himself knee-deep in a perplexing case that also involves the possible homicide of Mrs. Pinto's assistant, a young woman named Tiffany Benally. Leaphorn even receives an anonymous warning to beware of witchcraft! Also, a huge rift has developed in Joe's longtime relationship with his live-in companion, Louisa. Meanwhile, Joe's former colleague, Sgt. Jim Chee, and Chee's wife, Officer Bernadette “Bernie” Manuelito, are investigating a rash of burglaries in a few Navajo communities. The case turns complicated when Bernie finds a body near a popular running trail, which brings the FBI into the investigation, creating a mini turf war between the feds and the Tribal cops. As Bernie investigates, she finds the case coming close to home. THE LOWDOWN: I have been crazy about Anne Hillerman's work since I first read Spider Woman's Daughter. I had read two of her late father, Tony Hillerman's novels a long time ago, so I requested a review copy of Spider Woman's Daughter from HarperCollins when it was offered to reviewer back in 2013. It was a fortuitous decision, as I have come to view the “Manuelito, Chee & Leaphorn” novels as my favorite current literary series. “Her father blames witchcraft, and I'd agree that evil played a role. Not the supernatural kind but heartbreaking things people do to each other.” This is what Joe Leaphorn says to Bernie Manuelito in Chapter 21, after he has discovered the actual motive behind a murder in The Tale Teller. Those words also define the personal nature of Anne Hillerman's work in this series and in this novel in particular. The “Manuelito, Chee & Leaphorn” series has yielded some of the most delightful and inventive mystery novels. Hillerman weaves her novels, page after page of beautiful and evocative prose that brings her Southwest setting to life in living, vivid colors. However, it is the color she brings to her characters that make this series exceptional. Hillerman's books don't simply end with a big reveal, but are rather a series of reveals, revelations, and resolutions rooted in the personalities and in the nature of personal relationships of her characters. So when Joe Leaphorn speaks of the “heartbreaking things people do to each other,” he is essentially describing the nature of The Tale Teller. What people do to and for others is what drives The Tale Teller. They are not merely characters in a whodunit; of course, the mystery and the investigation are tied to the characters. However, their actions and complexities outside the central mystery are what Hillerman uses to create a larger and richer narrative. Anne Hillerman makes her characters matter. The Tale Teller, from its connection to an important time in the history of the Diné people to the dinner between four friends that closes this book, finds its telling of the tale in the interplay of the characters. And it is hard not to love a novel in which a boy gets a dog. I READS YOU RECOMMENDS: Readers waiting for exceptional mystery novels now have The Tale Teller.